Close your eyes for a minute and think about the best water slide you’ve ridden. Now think about the worst. What are the key elements you remember from each? I’m guessing for the worst ride there’s a specific feature or issue you could point out which you didn’t like and for the best ride you remembered a feeling or experience. That’s because great rides are immersive and elicit an emotional response (I feel like I’m flying) while bad rides have design flaws that break the immersive feeling and create an intellectual response (ouch I just banged my shoulder on that turn). A lot of factors go into designing and building a slide that’s safe for the younger riders but still exciting enough to keep the teens and adults interested. To achieve a smooth AND exciting ride, you’ve got to strike the right balance among several factors including slide type, slide width & length, and slide features. Put all these together (a fine balance of art, science and experience) and your setup will hit the sliding sweet spot—an exciting, immersive riding experience. Get the design wrong (too short, too much jostling, too extreme) and you’ll bump the rider out of the immersive experience and literally wash the smile off their face. One slide to rule them all? One thing you’ll note about the "Sweet Spot for Awesome Rides" chart is there’s a lot of variability between individual riders as to what makes an awesome water slide. If you’re just building a single slide, simultaneously satisfying riders on the extreme right and left is unrealistic. However, it is realistic to design and build a single slide that will do a great job for the majority of riders and then include customizable features to increase or decrease the level of excitement for individual riders. The first thing people usually decide on when it comes to designing their slide is the type of slide they want. Open body slides are the most popular slides with our customers, in part because everyone can watch the riders and they’re wide enough to accommodate mats, tubes, and other inflatables. The two other slide types we regularly install are drop slides/speed slides (if you’re looking for a direct high-speed route to the water) and tube slides (if you’d like to hide your slide under landscaping). We do get other types of slides from time to time so if you have something specific in mind, please share your custom water slide idea with us and we’ll discuss how to make your dream a reality. Once you’ve decided on the slide type, the next thing people usually think about is the length and width of the slide. If you’re just looking for a slide to handle riders up to the age of 10 or so, there are several solutions available from companies like Dolphin Water Slides to get you there with a 24” to 30” inside diameter open body slide and a total length in the 10-20’ range. 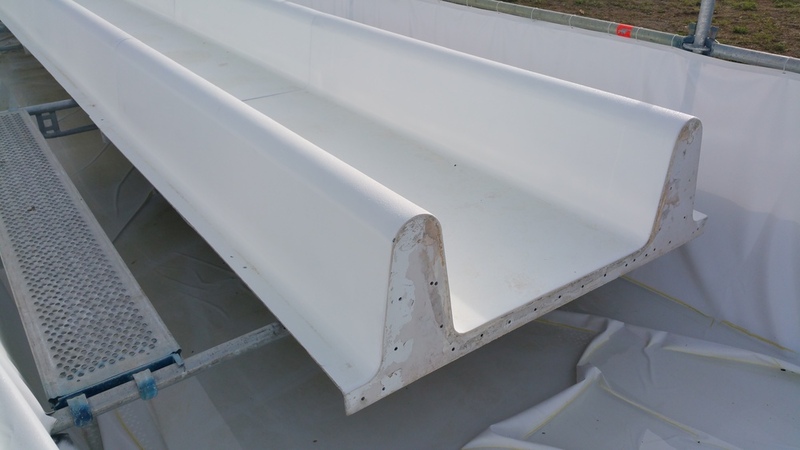 For those of you who answered questions (1) or (2) above with a yes, we strongly recommend going with the larger 42” radius commercial-grade waterslides like the ones we recycle and install for customers. The wider radius slides will deliver a more comfortable (and flexible) ride. If you’d like to read a bit more about water slide speed & inertia, here’s a great post from National Geographic: The Physics Behind Waterslides. Total drop from start to finish as well as slide type are the key inputs to figuring out the rest of your slide configuration including slide length and curves. It can get a bit complicated, so the majority of our customers simply give us the start and end points along with the approximate total drop and let us figure out the rest. As a baseline, the slides we install are at least 24 feet long but most are much longer. When you get all these factors right, the result is an amazing ride that appeals to a wide range of ages; and the broad appeal will help you to keep the play at your place with the kids and teens sticking around and bringing their friends. If you’re trying to figure out your custom water slide design and feel overwhelmed, just give us a call. We have over 8 years experience designing and installing custom water slides and would love to talk to you to about your vision. We'll help you build an immersive slide: one that's not only safe but also fun and exciting.